This figure was released in 2004 by DC Direct and based on the artwork of Frank Miller from the awesome Dark Knight Returns graphic novel. I didn’t purchase mine when it was released as my action figure collection hadn’t really jump started at that point. However, I knew this was one that I needed to have. There has been an updated set that was released in 2013 based on the animated feature of the same name but my figure is the one released in August 2004. 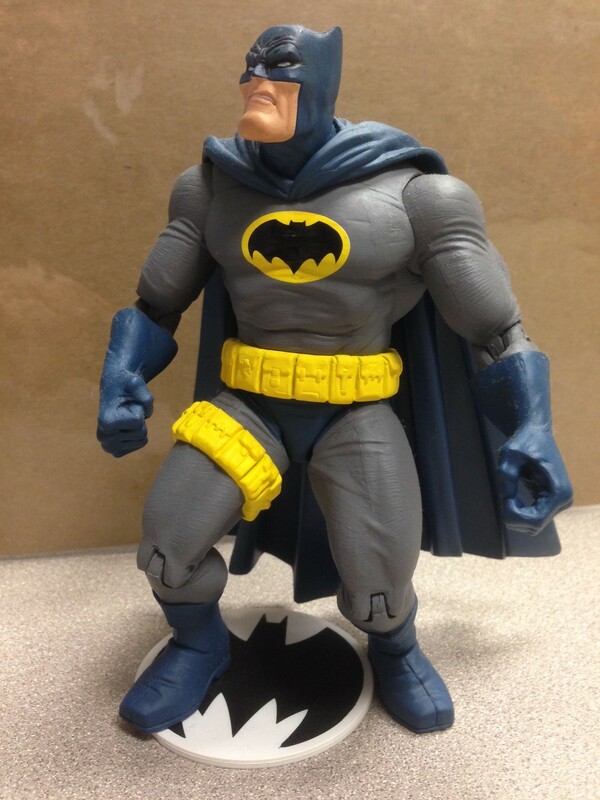 The updated version appears to have more subdued coloring and lost the right leg utility belt. One of the factors that really appeals to me about this figure is it gives me a closer to real life vibe on an aged Batman. He is muscular and in great physical shape for being older the figure depicts that he has a hunched over posture. I love the added leg utility belt as I would imagine as the threat of Gotham has changed over the years you would need extra gadgets to fight the evolving crime landscape along with older rogue gallery elements that he would have had to still fight. 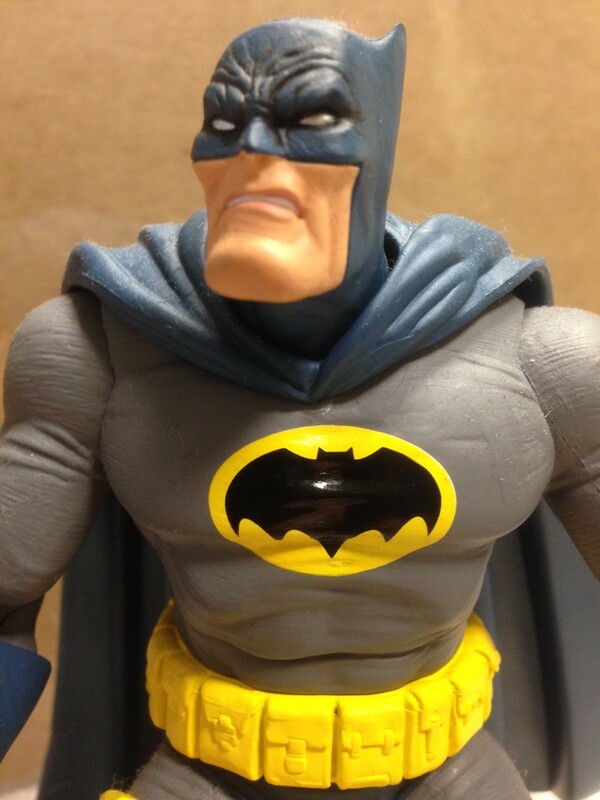 I love the facial features of this figure as it depicts forehead wrinkles that you would expect from an aging Bruce Wayne but the very characteristic grimace of the Batman. 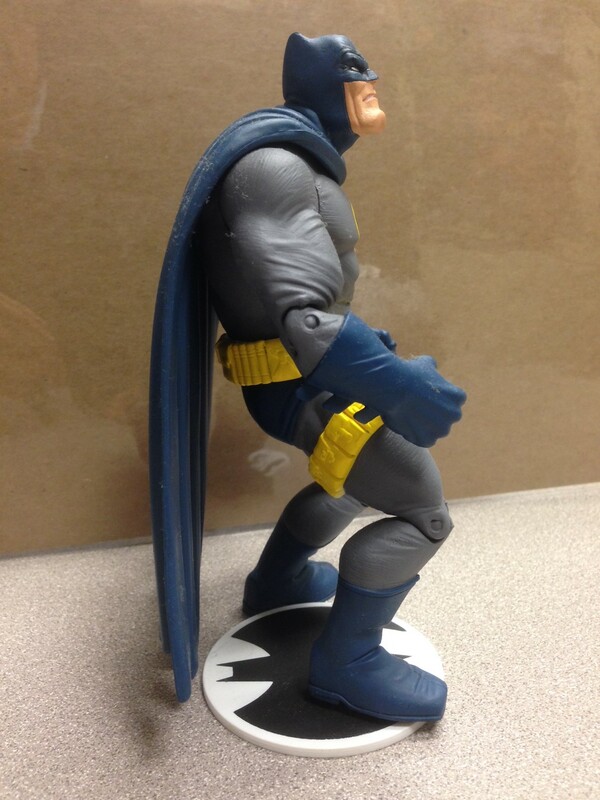 Unlike most other figures of Batman this one appears longer in the jaw line giving the further impression of age and works very well to characterize the source material. I am a fan of the bright yellow circle surrounding the chest emblem as I love the contrast this has of the bat suit with dark subdued colors. As the same color is on the utility belts this really makes those elements “pop” on this figure. Why is this figure cool to me? I was a late adopter into comic book reading and collecting. By late, I mean 18 years old. In 1989, it was the summer of Batman, with the huge marketing for the Tim Burton movie being releases, you couldn’t go far without being confronted with the Batman emblem. At that point of my life I was in my fledging days in the Navy and was attending technical school for my chosen Navy career. School didn’t fill every hour so we had nightly and weekend liberty. My technical school was located in San Diego, California. In 1989 I got the opportunity to visit what is now a very tough ticket and that was the International San Diego Comic Con. One of my introductions that summer was to the graphic novel The Dark Knight Returns by Frank Miller. My view of Batman has never been the same since that summer as he ceased to be the “campy” version from the old TV show reruns I thought he was. This figure brings me back full circle to a never ending passion in my adult life. Posted on September 13, 2014 by The Southgates and filed under Uncategorized and tagged batman dark knight returns dkr frank millier miller san diego comic con tim burton.